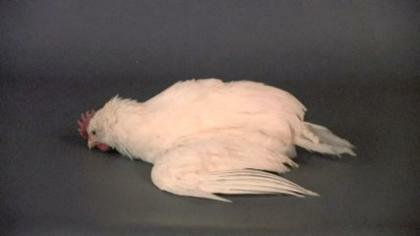 This chicken is exhibiting clonic spasms (or involuntary muscle tremors) resulting from infection with neurotropic velogenic Newcastle disease virus. Poultry infected with the neurotropic strains typically do not show dramatic clinical signs early in the course of the infection. However, after a brief period of depression, neurologic signs usually begin approximately 5-7 days post-infection.